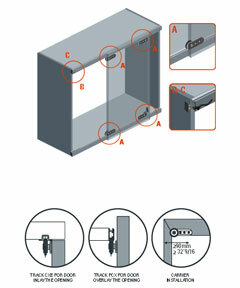 4 Points Sliding system for inline wood or aluminum doors. Doors can be intalled inlay the opening using the track CXE. Doors can be installed overlay the opening using the track FCX. CXE tracks can be installed for bypass door travelling.